We proudly welcome our musician of the month, Ikem Mazeli, a masterful crooner who skillfully blends Onitsha (Igbo) cultural rhythms with modern musical instrumentation. He began his musical career in the famous market city of Onitsha, and created a distinct mellow sound. The new highlife music of his Material Band incorporates multiple rhythmic elements that are subordinated to his dominant voice. The band’s vibrant guitars, scintillating percussive ishakas (shekeres), drums and musical pots create a compelling sound that forces everyone to sway to the music. Ikem makes amazing music. The fluid quality of his compositions underscores his status as “Owner of Music” (Onye Nwe Egwu). Listening to the pulsating beat of this troubadour one is transported to the heart of modern Igbo society. Ikem has over six albums to his credit and maintains a demanding live performance schedule all over Nigeria. A true crooner, his unique voice is a delight, serenading listeners with proverbs, folkloric poetry, philosophical insights, and messages that bind all together regardless of boundaries. 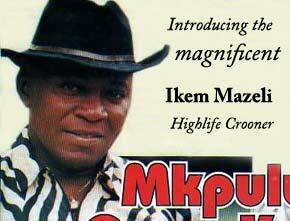 This is why Ikem Mazeli is AfricaResource Musician of the Month. - Editors of AfricaResource.